I love acorns and oak leaves. When Neal and I made a visit to Biltmore (speaking of, don’t forget to enter the giveaway I have running! ), we realized that throughout that magnificent house acorns and oak leaves were imbedded in the architectural details. Some are carved in wood moldings and others are chiseled into the granite on the exterior of the house. The Vanderbilts loved it as the acorn and oak leaf represent strength and growth. I am amazed today at how many times these beautiful motifs show up in decorating, tableware, and textiles. 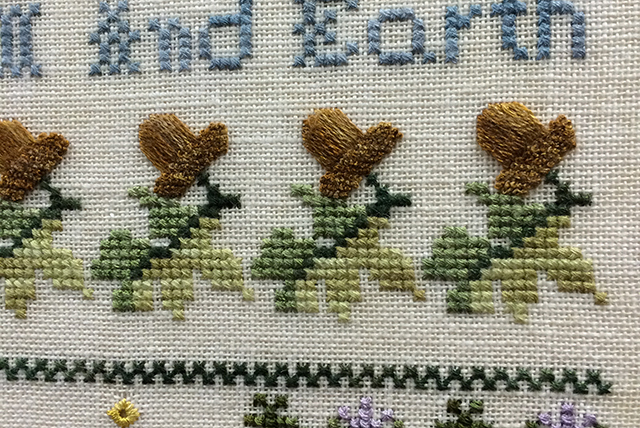 For years I have loved stitching the acorn motif into samplers. Neal and I decided to incorporate acorns and oak leaves into our monogram. Angela Atherton, who is a wonderful artist, created a monogram for us when we were married. But this one was designed for machine embroidery. She and several of her sewing friends surprised us with monogramed fabric that we used to recover our dining room chairs (pictured at top). What motif do you love, and what does it represent in your life? The things you share with us reflect a person of refinement, elegance and a life well-lived. I too feel that Neal has always had a big role in choices. So many times men get left out. You make us want to drop by for tea at your lovely table. Thank you letting us know you in this way. When we were first married my husband’s sweet grandfather gave me an embroidered handkercheif with a thistle. Both grandparents were reared in Scotland. I love needlework. You have given me an idea of creating a monogram with the Scotish Thistle. Thank you! I have and do use my grandmother’s monogramed silver flatware. I love knowing that monogramed linens, and silver have been passed down and will continue to be passed on long after I am gone. beautifully engraved “orange blossoms” have a patina that has worn more so beautifully over time… much more valuable than any diamond could be . 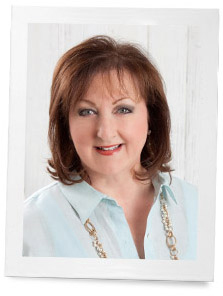 Phyllis, I so enjoy your blog. I noticed your china pattern: Herend Chinese Bouquet-Blue. I have the same pattern in Rust and was fortunate to go to the factory (my parents were living in Vienna) in Hungary and order mine before I was married. 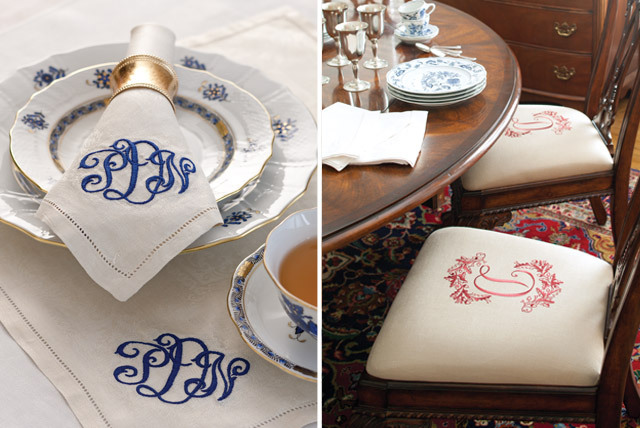 I have always adored anything monogrammed. Here’s a hint I learned from my grandmother to prevent wrinkles around your monogram when you iron linens. Place a plush bath towel on your ironing board and press the monogram from the back side on top of the towel. Make sure your linen is damp and iron without steam until dry. The monogram will “stand out” from the linen and the material surrounding the monogram will press smooth and flat. Great tip…..thank you so much. I enjoy watching for occurrences of the pineapple motif, a symbol of hospitality. Very interesting, I had no idea that there was an assigned ‘message’ behind this image. On another note, tell me more about creating a monogram for a married couple. Last name initial goes in the middle and is usually larger. The bride’s/lady’s first name initial goes on the left and the groom’s/man’s on the right. That is a lovely motif Phyllis.I too love leaf motifs and as a Canadian,especially the maple leaf. Thank you for this and all the lovely articles, they are always thoughtful and inspiring. I too loved your post on the Duchess, she is a wonderful role model for all women, particularly younger women. Phyllis, My husband, Keith, and I have both loved acorns and oak leaves all our lives. When he passed away in June 2013 I was faced with the task of designing a memorial (headstone) for our burial plots (we already had those). With the help of a very talented memorial designer/creator, the finished stone is in place. He asked me about our hobbies, fraternal organizations, etc. as a starting point. I Immediately told him we both loved acorn and oak leaves. He took it from there! I am proud to say we have one of the most beautiful memorials in the cemetery. I know Keith would be very happy with our creation. I am an avid needlepointer and have been looking for a good oak and acorn pattern to make into a cushion. I just recovered all my dining room chairs, but have not tired of ‘the sport’ yet 🙂 thanks for this nice article. What an elegant and wonderful surprise from your friends. Your dining chairs are beautiful. I have loved monograms since I was a teenager and my parents gave my twin sister and me monogramed leather purses. We were SO proud of them. Since that time I have loved and have several monogram pieces including jewelry. I incorporate the Fleur De Lis symbol into many of my designs. It is a symbol used for the city of St. Louis and I have grown up seeing it in designs in and on buildings around town. 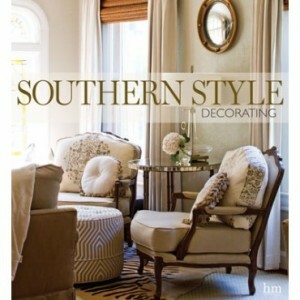 I also love everything French so it is present in my home decorating. We used the design at my daughter’s wedding last fall and it was lovely. I so enjoy your magazine and your posts. I greatly love the flour-de-lis as well. If it is anywhere within a room, my eyes will pick it out immediately! What a great idea for use in a monogram! Very interesting article I live in Michigan and have several oak trees on my property – and I am also an avid cross stitcher – could you tell me the pattern at the top with the acorns and leaves? Your article on the Duchess of Cambridge and her timeless clothes. Thank you for your lovely articles. I designed the sampler for Just CrossStitch magazine. It is the Sample of Psalms…..check the website. They might have the pattern still.